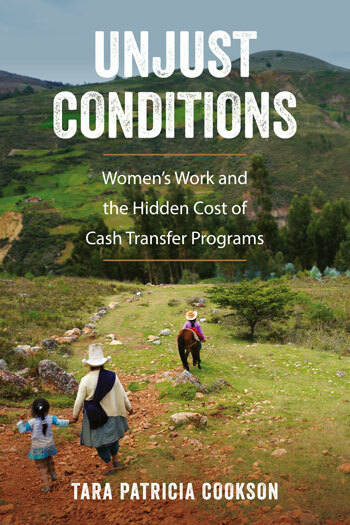 Unjust Conditions follows the lives and labors of poor mothers in rural Peru, richly documenting the ordeals they face to participate in mainstream poverty alleviation programs. Championed by behavioral economists and the World Bank, conditional cash transfer (CCT) programs are praised as efficient mechanisms for changing poor people’s behavior. While rooted in good intentions and dripping with the rhetoric of social inclusion, CCT programs’ successes ring hollow, based solely on metrics for children’s attendance at school and health appointments. Looking beyond these statistics reveals a host of hidden costs for the mothers who meet the conditions. With a poignant voice and keen focus on ethnographic research, Tara Patricia Cookson turns the reader’s gaze to women’s care work in landscapes of grossly inadequate state investment, cleverly drawing out the tensions between social inclusion and conditionality. TARA PATRICIA COOKSON is a SSHRC Research Fellow at the University of British Columbia and the founder of Ladysmith, a women’s equality venture. Her research on gender, international development, and social justice has been published in a variety of public and policy outlets as well as in academic journals such as Antipode.